School teachers may not be covered to remove or replace artificial eyes, so you will need an action plan in place in case of any problems arising during school time. Show staff a spare artificial eye so they know what to expect. Explain that the socket resembles the skin on the inside of your mouth or take in a photo of your child with their eye removed so they are prepared. Let them know how your child is likely to react if the eye should come out. Find out whether anyone on site is able to manage the situation in the event of your child’s eye coming out accidentally. 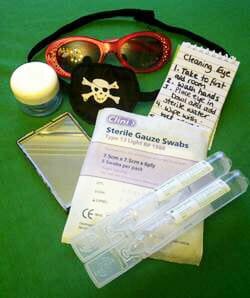 Sunglasses or an eye patch – whichever your child is happier to use whilst waiting for assistance. Ideally, your child should be working towards handling their eye for themselves but if they are not yet ready you will need to agree who will assist if it becomes dislodged and, if this person is a family member, what will happen with your child until they arrive. For children who suffer with regular discharge, ask for a mirror in the classroom as well to allow your child to check for themselves when their eye needs cleaning. If you would like further support with this please contact a CHECT support worker: support@chect.org.uk.